[By Jeffrey, New for Canada late 2016] Your friendly neighborhood Junk Food Jeff with another review from north of the border. 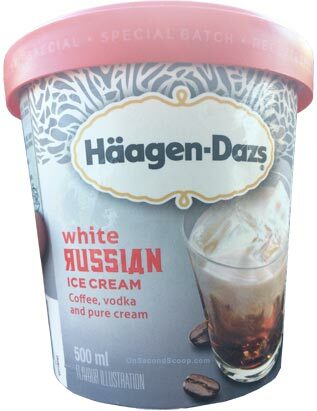 Last week, I was lucky enough to be the first person to spot the new Haagen Dazs White Russian Ice Cream which contains 1% abv (note: it isn't noted on packaging at all, just according to the Nestle sales rep I talked to). This is their first mainstream alcohol-infused ice cream and apparently the first flavor in a line of these slightly drunken desserts. The packaging is definitely eye catching because of the shiny silver instead of the typical Haagen Dazs "creamy gold" I'll call it. The container boldly states the ingredients include coffee, vodka and pure cream with a picture of the drink and the words "flavor illustration" in case you thought it was a frozen version of the drink and not a dessert. 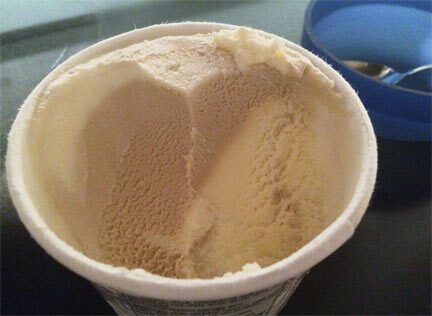 The initial look of the ice cream just looks like plain French vanilla. It's not until you put your spoon through it that you see the bicolored ribbons. It's swirled so interestingly that it almost seems like two separate ice creams. One is definitely white and the other is milk chocolate brown. The two ice creams have very different but very complimentary flavors. The brown section tastes like coffee that a kid made for you, loaded with sweetness and cream with subtle diner coffee flavor and bitterness. The white tastes like a vanilla vodka milkshake; premium French vanilla ice cream with the subtle taste and astringency of vodka. The alcohol doesn't hit you like a brick wall at all, if anything, it tastes almost like when you're drinking Kahlua and you take the last sip that's been watered down by your ice cubes. Mostly cold, slightly creamy, with the slight taste of vodka. When you get a spoonful with both flavors, it really gets turned up. 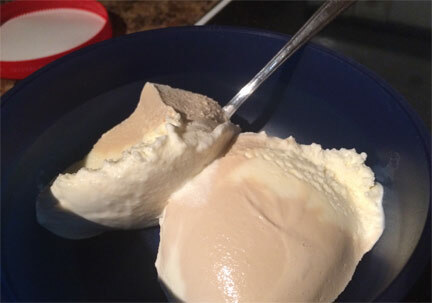 The bitterness of the coffee and the bitterness of the vodka get quickly cancelled out by the sweet, creaminess of the ice cream base. Every spoonful is slightly different based on how much you get of each color and that alone makes you go back for more. On Second Scoop: This is one of the best tasting Haagen Dazs ice creams I've tried. I find HD's ice cream bases to be decadently creamy, and this one is no different. It's unique. It's something I personally never tried before and it makes me crave a White Russian (I don't usually drink but I had one at Xmas, two years ago) It's not very "alcohol-burny" and is actually a nice after dinner treat. I personally can't stand drinking alcohol because of the burn and fermentation (it reminds me of carbonation which I hate in soft drinks). However, Haagen Dazs is definitely my favorite ice cream brand (I have yet to find a sea salt caramel gelato I enjoy more) so I would DEFINITELY try this. I didn't try Ben & Jerry's ale ice cream, but something about this just seems more appealing and less offensive to me. Love the layout and the pictures are actually making me hate you a little bit. Nothing personally of course, I'm just filled with so much jealousy and would die to be in your shoes right now! Please keep us updated on this! @Anon: don't take this the wrong way, but it seems like you are sensitive to both bitter and sweetness? It seems like it's one of the other for most people, or maybe I just haven't thought about it enough. For me personally, i have a low bitter tolerance but a high sweetness tolerance. P.S. are you saying you drove 5 km for this or do you mean something else, i ask because 5km isn't very far. Yeah, well, you know, that's just, like, your opinion, man. -- the dude. If I can never try this, I'm not even mad about it. I'm more upset about the discontinued irish cream flavors and the pecan bourbon flavors I can't seem to find around here. When does this flavor hit nation wide? Been looking since this post, and have not found it. @TTB: hate to be a downer but check out the first line of the review: "New for Canada". We believe their will be six flavors in all, no idea if we'll ever see them in the states. Quite pleasant. As with most ice creams, you get the best effect for the flavour if you let it soften up to some degree. The vodka is quite subtle - it's just there enough to let you know it is there. I agree with your review 100%. This is exactly how I perceived the flavours in White Russian. Every spoonful is amazing and unique.